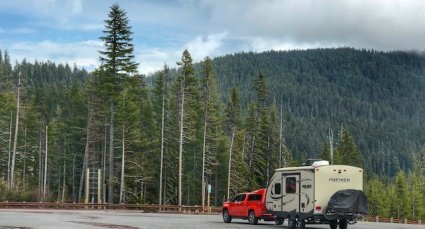 We had a sort of homecoming when we came back east to camp in Bend; a few weeks back we had camped about an hour south of Bend in Crescent. And while Bend traffic was not so wonderful, the sites and trails we biked and hiked most certainly were. This stop was all about nature; about getting outside and enjoying the bounty of spring weather and spring blooms — and being grateful for all the many blessings God has bestowed on us. 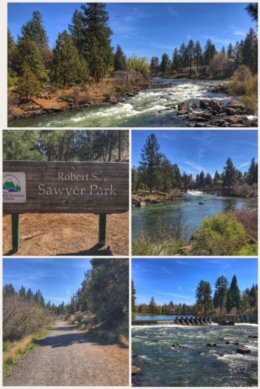 Our first adventure was biking the Deschutes River Trail, right in the heart of Bend. We used the trailhead at Robert Sawyer Park, which straddles both sides of the river, to jump on to the trail. The trail had a few tough hills, but mostly followed the river, and was quite beautiful — especially for such an urban setting. 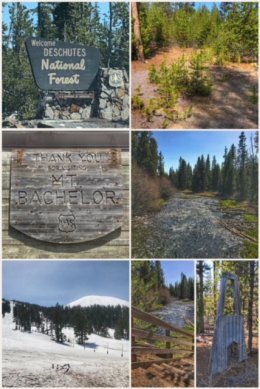 Next up, we attempted to see the remainder of the lakes within the Deschutes National Forest along the Cascade Lakes Scenic Byway. Amazingly, the northern stretch of the byway was still closed (and parts covered in snow), so we adapted, and first stopped at Mt. Bachelor (where a small group of people were still skiing and snowboarding on the slopes), before heading deep into the national forest for some additional exploring, finding a creepy, but cool abandoned campground (with saplings growing in RV spots, electric power ripped out, and gates blocking the entrance). We also gathered several armfuls of firewood and kindling to take back to our camp for a wonderful fire later in the evening. 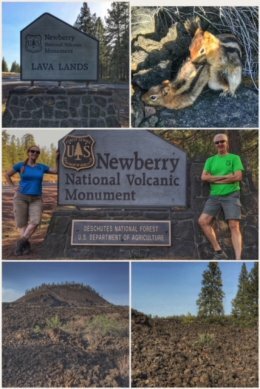 Perhaps the highlight of this stop was the Newberry National Volcanic Monument, located just south of Bend, and created in 1990 when it was carved out of the Deschutes National Forest. The monument is managed by the U.S. Forest Service — and our only disappointment was that the visitor center at Lava Lands had not yet opened for the season, which we found very odd given the late date in April, and thus we missed out getting to the top of Lava Butte. We walked bits of the Trail of the Whispering Pines, as well as the Trail of Moten Land (where we saw two Golden-mantled Ground Squirrels procreating). Note to bicyclists: Consider parking at the visitor center and taking the fully-paved and gorgeous 5.5-mile Sun-Lava path down to the Benham Falls Trailhead; sadly, we did not have our bikes with us that day, so drove those miles and parked at the trailhead for our next adventure. 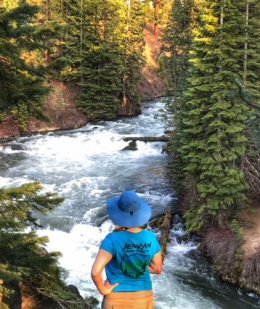 The 1.5-mile hike to the falls mostly follows the river and is quite peaceful and beautiful, walking among old growth Ponderosa Pines, as well as Aspens and other riparian shrubs — and was the perfect ending to a wonderful day spent in nature… ah, the sounds of the river and falls — the scent of all those phytoncides! 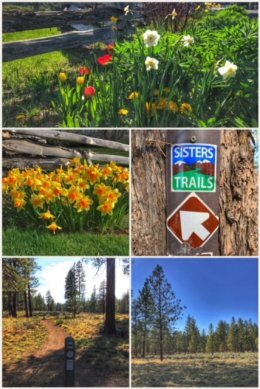 We concluded this nature-adventure in Bend with a bike ride mostly through the Deschutes National Forest on the Peterson Ridge Trail, starting in the town of Sisters, at the Village Green Park on South Elm Street. The trail is more designed for mountain-bike riders, but our hybrid bikes did just fine on the turns and rocks and roots along the trail. We had started on the old logging road trail, which was pretty boring and simply lucked out on jumping onto this bike trail. 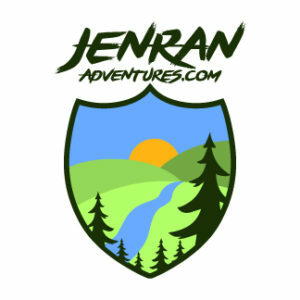 If you love forests, this is the trail for you! A side benefit: Sisters is a lovely town and we lucked out in finding a produce stand, where we bought two dozen farm-fresh eggs! 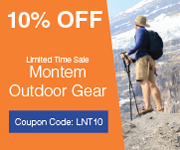 Next up: Back to the Columbia River Gorge National Scenic Area — and our first foray into Washington state! Next Post:Stop 26: Columbia Gorge-ous!